This beautiful Blue Pine Coffee Table was created using upcycled materials and is a part of our Beetle Kill Collection. It has been lightly sanded and finished with oil to maintain the rustic feel but also preserve the integrity of the wood. Made of Beetle Kill Blue Pine. 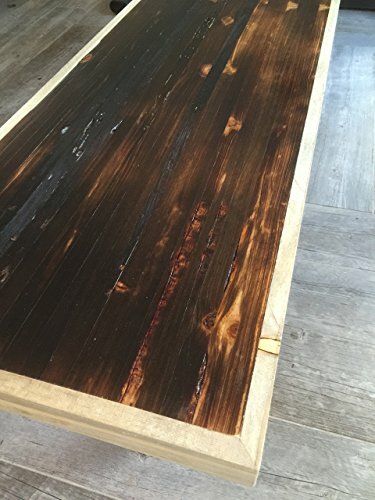 The table top Has been lightly charred using a shou sugi ban technique. The Beetle Kill Collection An epidemic has developed in recent years, Mountain pine beetles have spread across millions of acres in western North America. Some of the most majestic natural resources in the Rocky Mountains: Pine trees, The Beetles work in mass to infest Ponderosa and Lodgepole pines, The beetles carry a fungus with them as they burrow in the bark to reproduce. This fungus spreads and stains the sapwood a striking blue-gray color and cuts off the pines' life-sustaining nutrients, Eventually killing the trees. Resulting are vast enclaves of gray, needleless pines that litter the forested Rocky Mountain landscape. These dry trees are potential wildfire hazards in an already fire-prone region. The blue-gray color of the pine gives dramatic natural character without diminishing the strength or integrity of the wood. We are proud to have helped pioneer this beautiful method of recycling beetle kill pine from the Black Forest in Colorado.